Preheat oven to 375° F. Grease a 6-cup muffin pan or insert paper liners. Finely dice 2/3 cup toasted pecans and set aside. For the topping, combine half of the nuts (1/3 cup), brown sugar & oil in a cup and set aside. In a large bowl combine the oats, flour, sugar, baking powder, baking soda, and salt. In a smaller bowl using a hand mixer on low speed, beat the milk, oil, egg, banana, and vanilla until smooth, about 20 seconds. Fold banana mixture into flour mixture, followed by remaining 1/3 cup pecans. Divide batter between muffin cups & top each one with nut mixture, pressing down lightly. Bake for 20-25 minutes (23 minutes works for me). 31 Comments on "Crunchy Oatmeal Banana Muffins"
These are the best muffins! Dug deep into freezer and found frozen ripe bananas….what to do with them? Jenny’s recipe was a perfect! Everything I make from her recipes over the years is fantastic. Just follow along and you will be amazed! Thank you Jenny for sharing. I made these and they were Awesome! Great taste and not too sweet. I doubled the recipe and made 22 muffins. Must have had a smaller size muffin pans. Made more to share with friends. I will definitely make again. Thanks Jenny! Hi Jenny; sorry for the late reply. In answer to your question regarding what ingredients I used. I used exactly what the recipe calls for. It’s hard to help with limited information. I make these muffins often with consistent results. Can you please tell me the brand of oats, flour, type of milk & oil, and the method you used to combine the mixture. What are the expiration dates of your baking soda and powder? Also, did you use a 6-cup muffin pan and and if so, what is the size across the diameter of one muffin cup? I’d will try to help if I know a little more. Thank you. Hi Jenny. I just made these muffins. They taste yummy but they didn’t rise very much and they are a little dense. Any thoughts on what I did wrong?. Thank you. Please list each of the ingredients you used (be specific) as well as your method and I will try to help. I made these yesterday using grape seed oil and they came out great. I got 8 muffins out of this recipe. I made these using dark brown sugar in the topping and batter, as well as using a mix of toasted pecans and walnuts. They were very tasty and will be made very often for breakfast. milk. Could I use that in your recipe’s? Hi everyone, I usually bake at least 1 dozen muffins and I find some of Jenny’s recipes are for small batches. Will most of these recipes turn out ok if I double them? Have had some trouble in the past . Some are just better in small batches . Thank you Jenny for all your hard work, I would have never made bread without watching you do it. You are a Jewel . Nice muffins! And turned out exactly as Jenny described them: crunchy on the outside, tender and moist on the inside. Quick and easy to make. And a great way to use a couple of overripe bananas. It’s a summery Saturday morning, and I didn’t want to use the range oven, so I tried these out in both of my portable countertop ovens. Both produced beautiful muffins that rose nicely and toasted the topping. But, to my surprise, I think the small glass-dome convection oven produced an overall better muffin than the other, more conventional countertop oven. Who says portable convection ovens are no good for baking? And the kitchen is nice and cool. Just wanted to let you and others know that I made these muffins with whole wheat pastry flour this afternoon and they turned out amazing!! I ended up with 8 muffins. 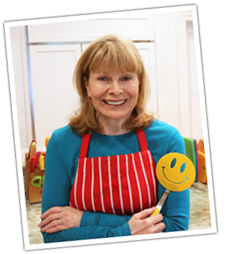 Thank-you so much for sharing your recipes with the rest of us – much appreciated!! 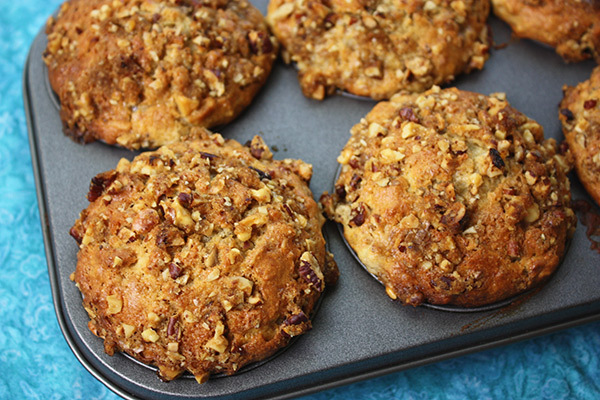 Just made these in my “muffin top” pan. Yummy! Thank you! I was just wondering if that would work. These were delicious. Made them Sunday morning, gone before lunch. Love that it is a small batch. My son asked how long it takes to make these, ha ha. Jenny: I have NEVER used one of your recipes that have not been perfect and healthy. Thank you for all the great recipes – I wish I could name a favorite, but they are ALL favorites that I use over and over. Please share this “sugarless muffin” recipe. I’m not sure what she was referring to as I do not have any sugarless muffin recipes. Can you use cake flour instead of adding the baking soda, etc? These look great, I will try them. I might add craiisins too. No. Cake flour does not contain a leavening agent. I am on blood thinner to avoid blood clots and should avoid Vit. K like is contained in bananas. Is it possible to substitute applesauce or avocados or what could you suggest? Have you tried these substitutions yet? I’d love to hear your results if you have! I made these muffins this afternoon as I was baking bread so the oven was on. These muffins are simply delicious and easy to make.